Spring is upon us, and that means the infamous spring clean is due to hit homes across the country over the course of the next three months. After a busy festive season, there’s likely to be a certain amount of clutter to remove from your home too – and finding a place to store or offload these items should be a priority for homeowners. Whether you’re motivated to maintain a minimalist home free from all forms of clutter, or you’re merely hoping to make space for family and friends, this is your three-point guide to decluttering your home. The default place to store items that are rarely used in your home is in your storage facilities, generally limited to garages and attic spaces. Here, you’ll be able to organise your possessions away from the interior of your home in order to free up space in your most-used rooms. 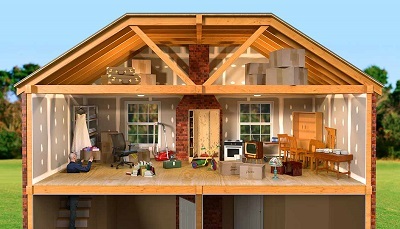 Attic spaces typically hold household items like old lamps and Christmas decorations, while garages take on tools, spares and repairs, and other odds and ends that might be useful in renovation and DIY. If you’re struggling for space in your storage facilities, it’s worth investing in some extra square metres of space. Alternative garages and storage sheds can be purchased and erected through industry specialists, perhaps in your back garden or attached to your existing garage. By extending your storage space, you’ll be able to free up other areas in your home that you might eventually look to convert into new rooms, such as your attic space. Earn a little cash while recycling your unwanted possessions in a garage sale, ideally to take place on a sunny weekend across the course of the next couple of months. While these sales can be hit-and-miss, depending on your neighborhood and the things you’re trying to offload, you can make a few bucks from those around your vicinity by opening up your home and your excess possessions to the public. Sometimes it’s worth putting up signs around your locality directing locals to your home for the date of the sale, such as chalk arrows on the pavement or roads to intrigue passers-by. When it comes to negotiating a price, it’s down to you to decide how badly you want to get rid of the items you’re bargaining over. Low prices will mean you shift more of your possessions. Your very last thought when it comes to decluttering should be taking your items to the dump; in today’s environmentally-friendly world, you should consider all other options before proceeding to throw your unwanted possessions away forever. Can you recycle some of your items? Are they made from recyclable materials? Are you able to reuse them, or redeploy them in a different way that makes them useful once again inside your home? Whether you understand that you can donate unwanted furniture to a charity warehouse, or you can hand down baby clothes to families with younger children than your own, there’s always a way to avoid dumping your clutter. There you have it: three ways to declutter as you clean during spring 2019.